The elite Tour de France is over for the year, 21 stages and more than 2,000 miles only a memory. We have memories of our own of our shorter, smaller Tour de France. Some of the same hills, but tackled by amateurs. 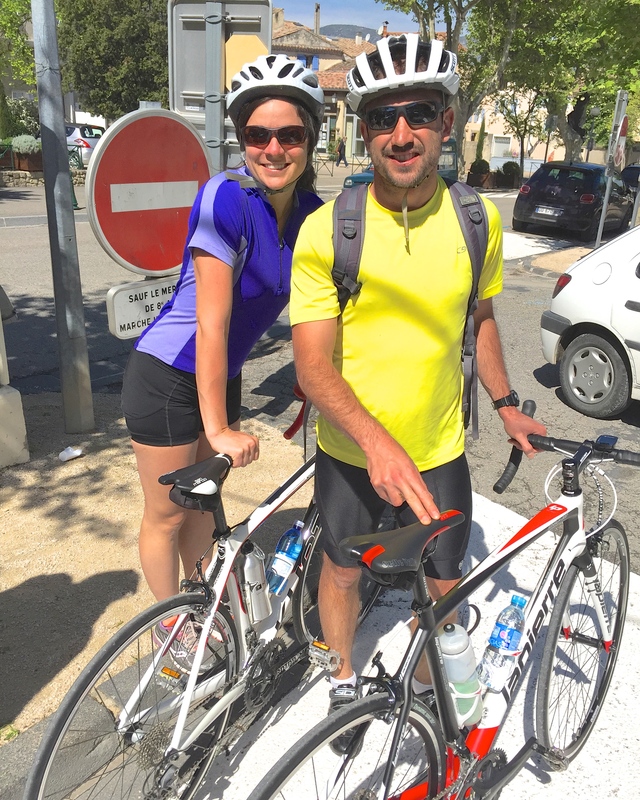 Jesse and Liz rented bikes for a few days and cycled over 130 miles, going from Malaucene to Avignon, Cavaillon to Apt, Pont du Gard to Malaucene. Lovely rides on generally quiet French country roads (which do not have shoulders!) Michael and Nancy were the support team, meeting up at a hotel at the end of day, and often having a meal of wine, cheese, pate, and a baguette. Very civilized biking. 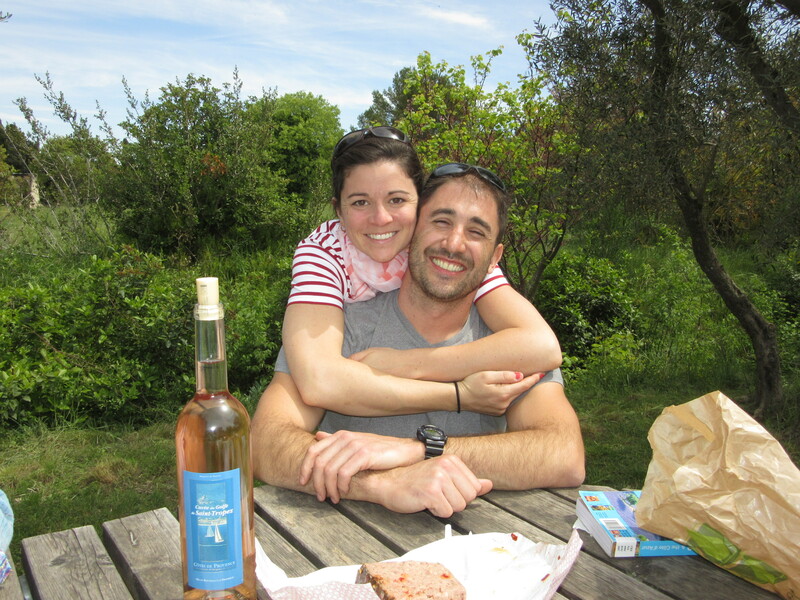 Liz and Jesse with two favorites of the trip: Provencal rose and Jesse’s pate. However, this biking wasn’t enough of a challenge for Jesse. First a brief anecdote about Jesse’s biking commitment, (which later became part of Michael’s toast at the wedding). 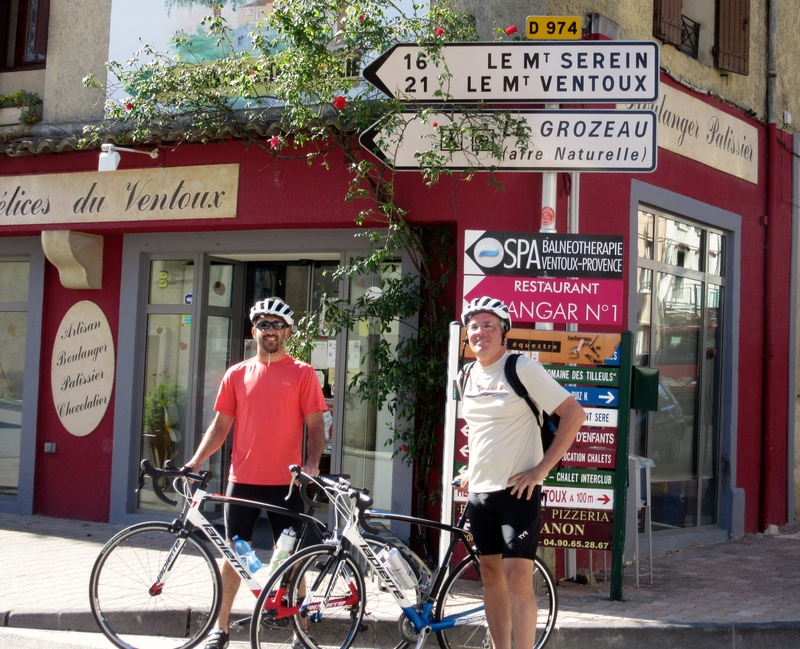 After biking about 20 miles one day, Jesse and Michael were making a steep climb toward Menerbes, a difficult task. While pedaling his legs off, Jesse was passed, not by just anyone but by a little old lady. Sacre bleu! Jesse would not be beaten by a little old lady. He found some inner strength and pedaled on, faster and harder, eventually passing the lady and beating her to the top. When Michael caught up to him, he was chuckling. What Jesse didn’t realize was that he wasn’t passed by a little old lady; he was passed by someone on an e-bike (e for electric), a bike that essentially powers itself. Nevertheless, Jesse won! So Jesse was looking for something more challenging than the rolling hills of Provence. 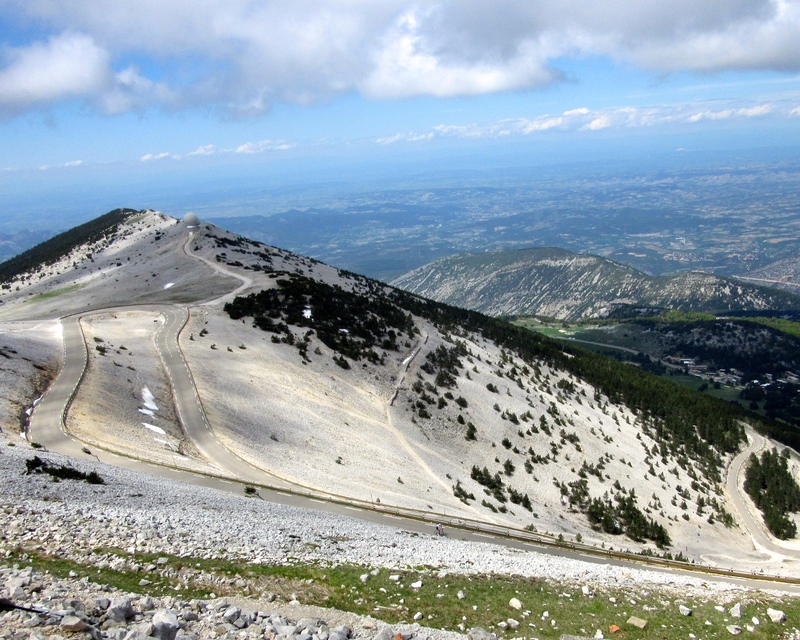 One of the most famous peaks of the Tour de France in some years is Mont Ventoux, 6,240 feet tall, with miles of biking above 10% grade. Naturally this is a siren for competitive amateurs. Jesse wanted it. Michael, who completed three triathlons in 2014, was up for it too. The day dawned clear and pleasant. 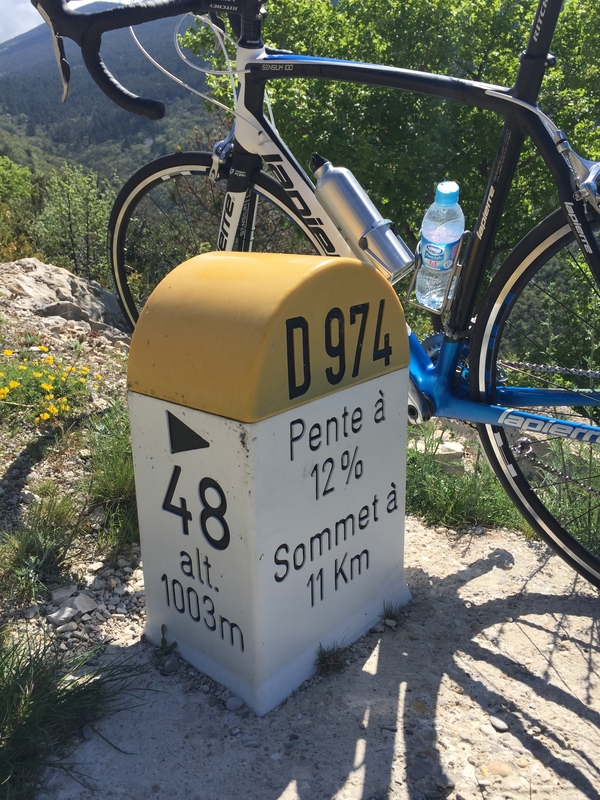 Two men in lycra set off from Malaucene on the climb up Mont Ventoux, 13 miles and 4,900 feet of elevation change, with average grade of 7.2%. Could they do it? Jesse and Michael together at the start of the climb. Within a few minutes Jesse was speeding ahead, out of sight, never visible again on the climb. Michael made a valiant effort, not to catch up, but to reach the top. With 6 miles to the top, Michael’s bike requested a short break. “Only” a 12% grade. At just a couple miles shy of the peak Michael had to give in. His legs had turned to jelly. Jesse was far ahead, tackling the final stretches. The last bit of the climb is cold, windy, lonely. Oh, and still very steep. Yes that is snow. Jesse arrived at the peak long before the bikers were expected. His support team (Liz and Nancy) had to drive the car up a different route and got there after Jesse, cold and tired, had already headed back down. Unfortunately, his dry shirt and jacket were in the car. It was a long, very fast coast down the hill, with the wind chill making it very, very cold. Back at the base Jesse was shivering with excitement at his accomplishment. Check that: He was shivering with near hypothermia! In any event, it’s a significant biking accomplishment for both of our boys. Congrats! 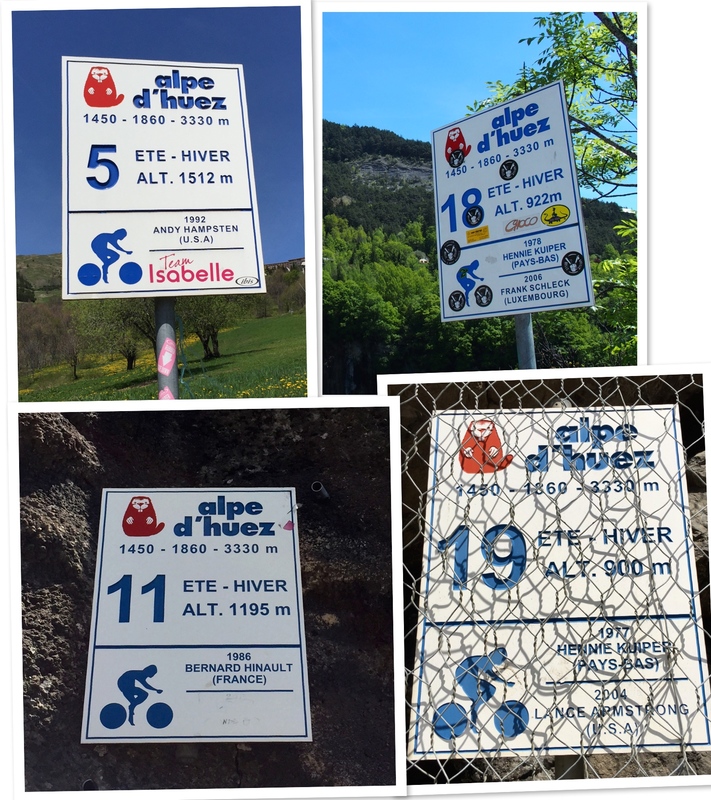 On to another favorite climb of the Tour, the Alpe d’Huez. Is biking in the mountains popular here? Yes. 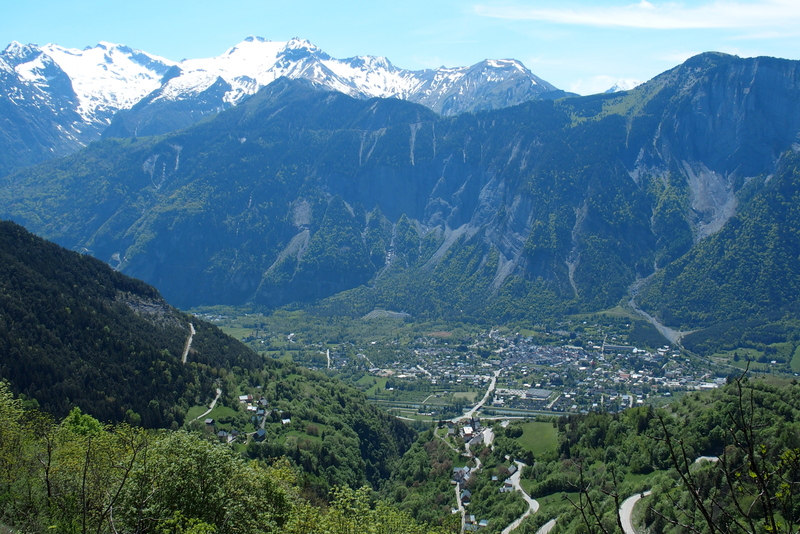 Alpe d’Huez is over 8 miles up the 6,100-foot mountain at 8% grade. No, we did not attempt this. Mid-May and there is still snow on the mountain. This was about 8 weeks before the official Tour de France. Lots of guys in lycra shorts, and some ladies, were tackling the route. The image doesn’t capture the actual steepness of the grade. Along the serpentine road up the mountain (21 hairpins), many curves have signs dedicated to prior Tour leaders. The 19-kilometer marker still shows Lance Armstrong’s name. Is the Lance Armstrong sign behind a fence as protection? We were happy to ride the route in the comfort of our car. Last month we watched dozens of bikers making the climb look easy. Alpe d’Huez. View from the top! 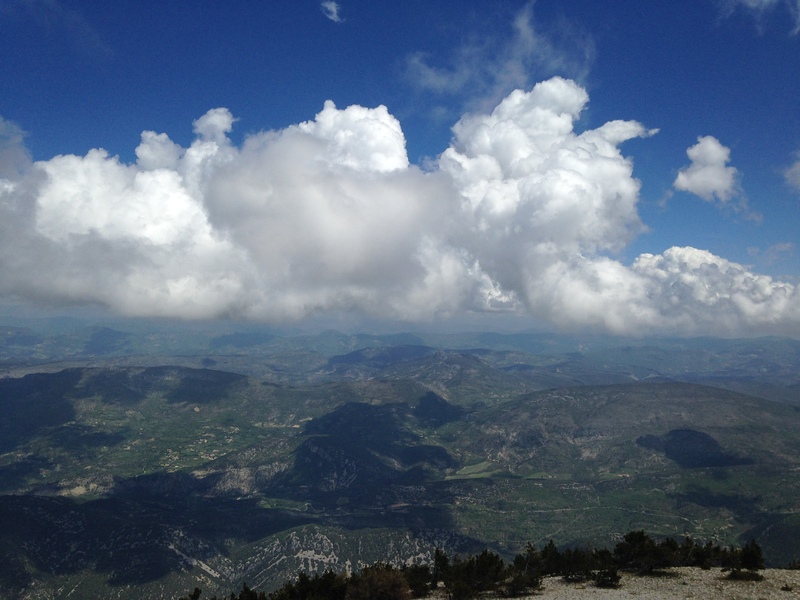 This entry was posted in Smell the Roses and tagged bicycling, France, Mont Ventoux, Tour de France. Bookmark the permalink.